Shahzia Sikander, RISD MFA ’95, will speak on April 15, 2014, 6:30 pm, in the Metcalf Auditorium. 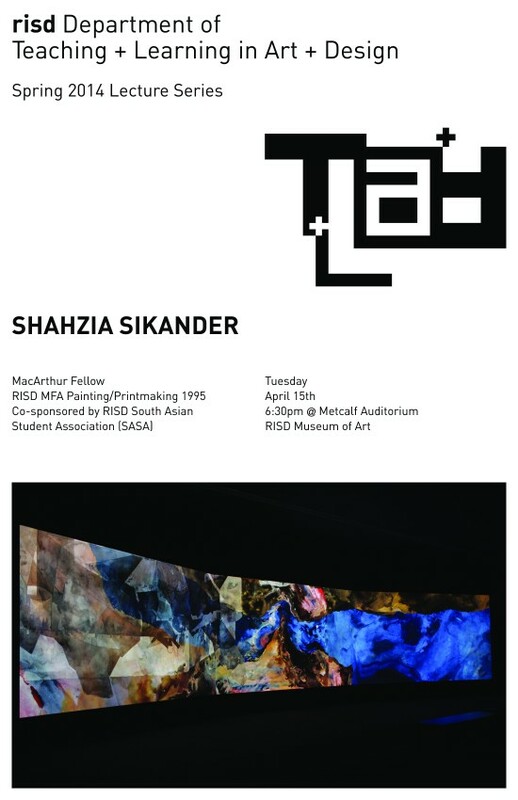 Shahzia Sikander was born in 1969 in Lahore, Pakistan, and currently lives and works in New York City. She holds a BFA from the National College of Arts, Lahore, Pakistan, and an MFA from the Rhode Island School of Design. Her work spans a variety of mediums including drawing, large-scale wall installations, animation and video. Sikander has successfully brought Indo-Persian miniature painting into the realm of contemporary art through subverting her training in the genre with commentaries on lived experience, art history and pop-culture. Sikander’s work is included in the collections of the Museum of Modern Art, the Whitney Museum of American Art, the Solomon R. Guggenheim Museum and the San Francisco Museum of Modern Art, among many others. Her work has been exhibited at venues world wide including major solo surveys at the Irish Museum of Modern Art in Dublin and at the Museum of Contemporary Art in Sydney Australia (both 2007). She also participated in the 1997 Whitney Biennial, the 2005 Venice Biennial, and recently in the 13th Istanbul Biennial and Sharjar Biennial 11 (both 2013). Among her many recognitions, Sikander was appointed a Young Global Leader by the World Economic Forum in Davos, Switzerland in 2006. She is also the recipient of The Louis comfort Tiffany Foundation Award (1997), the Tamgha-e-imtiaz, Medal of Excellence award from the Government of Pakistan (2005), a MacArthur Foundation Fellowship Award (2006), and the Inaugural U.S. State Department Medal of Arts (2012). Similarly to her miniature paintings, Sikander relies on the process of layering to create digital animation. Formal elements of technique, layering and movement of the digital animations help to unhinge the “absolute of contrasts such as Western/non-Western, past/present, miniature/scale.” Sikander explains her appreciation for the process of layering in digital animation, allowing the narrative to remain suspended and open for reinterpretation. Sikander states; “The purpose is to point out, and not necessarily define. I find this attitude a useful way to navigate the complex and often deeply rooted cultural and sociopolitical stances that envelop us twenty-four hours and day, seven days a week. The talk is sponsored by the South Asian Student Association.